You see the brahmins cluster together in a South Indian cluster and and East Indian cluster. The exceptions are HRP0052(Kayastha in the cluster) and HRP004 who is not in the cluster. It would be useful to find out the caste/tribe status of the gujuratis in the project , as they are a match to the gujurati reference cluster which has the high south asian admixture. It would be enlightening , could you also ask the vanilla punjabis to also elaborate on what ethnic group they belong to as well? I have asked the Punjabis and Gujaratis by email Let's see if any of them would like to comment here. HRP0012 has one parent from Gurdaspur/Jammu area and the other from Rawalpindi area. Caste/community unknown. A question in a similar vein. I notice that I (HRP0003) am now closest to the U.P. Brahmin HRP0063 rather than U.P. Brahmin HRP0029. Both HRP0029 and HRP0003 are not priest Brahmins (they were trihotras or performed only three Brahmin functions). Do you have any additional information on the type of Brahmin HRP0063 is - Taga, Bhumihar, or Gaur, Sarwaria, Kannaujia, etc.? Parasar, you might want to add him on 23andMe, and then perhaps ask them about their specific sub-caste. I PMed you his username on 23andMe. Also, the admixture dendrogram results are quite congruous with 23andMe's ancestry painting results. HRP0063 is 84% European whereas you are 82%, whereas the other U.P Bhumihar Brahmin is 89%. 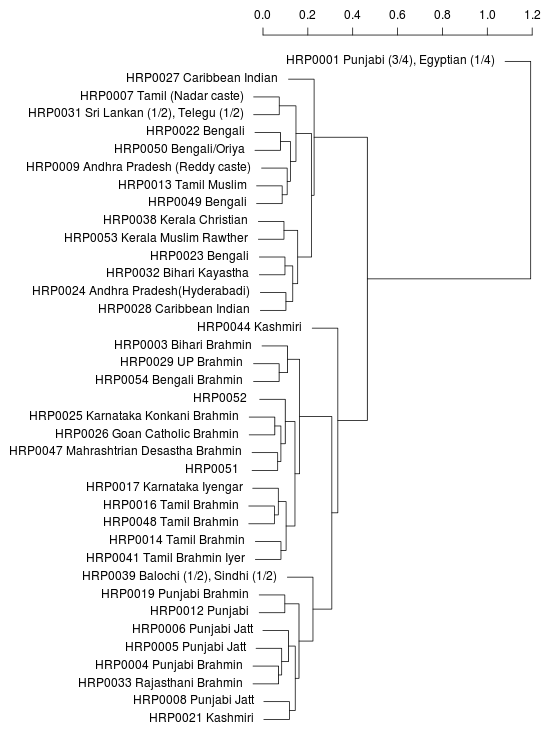 Likewise, in this admixture dendrogram I am closest to the Goan Catholic of Brahmin descent and the Karnataka Iyengar Brahmin (HRP0079), who are 79% and 80% European respectively, on 23andMe. what specific info do you want. I am punjabi.father from Jullander,His parents all from punjab.before them i dont know.My mother also punjabi born in kenya as i was.her parents from punjab.father from Jullandar.mother from Amritsar.I think there parents also from punjab.We are not Jatt but capenters( Ramgharia--if that means any thing. )I also heard my father use a Word...Gotth......His NAROTHA......I dont know what it means. It is interesting the , the dhimans are almost identical to the punjabi brahmins. The pre-Mughal name of the Punjab was Takk or 'to cut,' a variation of which is Takhan or carpenter. See also Takk-Shila (Taxila), cut rock. I thought the name of the Punjab was given by the persian empries meaning the land of five rivers? I think you mean given by Mughals (who were indeed Persianized Turko-Mongols). The earlier names I see used are Takkadesh, Aratta, Panchnad, Madradesh etc. Eg. Madradesh was the name used by Gobind Rai (cf Bichitra Natak Tahoo prakaas hamaaraa bhayo. Patna sahar bikhai bhav layo. Madra des ham ko le aae). What year range can you say the punjab was called the "punjab" then? The words are supposed to be territorial or functional descriptives. Taga=Tyaga=Tyagi - those who gave up priesthood. Kannaujia - from Kannauj the medieval capital. Maybe you've been asked this question before: How would this dendrogram compare to 23andMe's 'compare genes' feature? Specifically, would a person who is, say, 75% similar to me be closer to me on this dendrogram than a person who is 70% similar? The compare genes feature looks at all your SNPs and gives all of them equal weight. This dendrogram is based on Admixture results. Admixture tries to compute ancestry based on allele frequencies in different populations. It looks at population structure of the SNPs. Thus it necessarily prioritizes SNPs which have differences among populations. So they would be very different. BTW a couple of posts based on "compare genes" (IBS matrix) are coming soon. 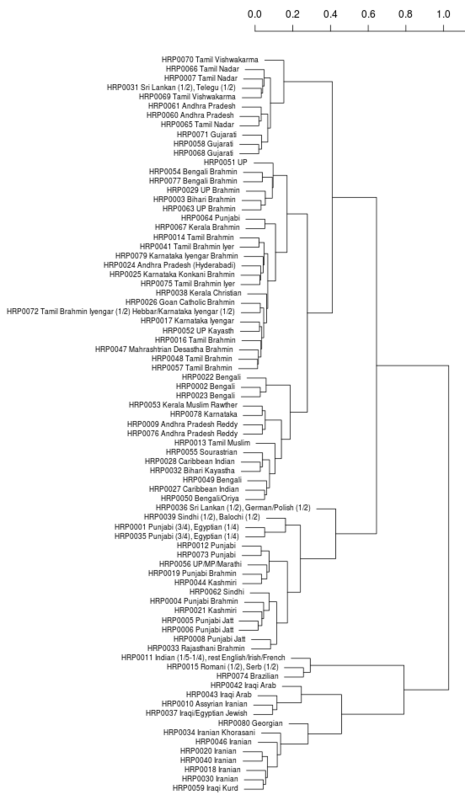 How about the Euclidean distance dendrogram - http://www.harappadna.org/wp-content/uploads/2011/03/r1_sa_hrp_pca_dend.png - it seemed to club together connected populations very well. That's from PCA. I'll do that soon too. a) The cluster with HRP022-HRP050 is interesting. What's the common thread here? How would we characterize it? b) The NW subcontinent's divergence from East/Central/South seems pretty fundamental - they're connecting only at 0.6 which seems like a lot. Is there something about this dendrogram that is exaggerating it more than it actually is or is it really such a distinct blob? c) Punjabi HRP064 - very unexpected cluster location. That's really interesting. Zack, is this person a "blend" who got classified as Punjabi? If not, it would be very interesting to know their ethnicity. d) Kashmiri HRP021 (disclosure: my spouse) clusters with one set of Punjabis (the Jatts + one Brahmin) and Sindhi+Rajasthani and Kashmiri HRP044 with another (me and my group). Curious what would happen if more Kashmiris came in. e) HRP056 - UP/MP/Marathi. Any info on their ethnicity? Is HRP0021 a Kashmiri Pandit? Dogra and Kashmiri mixed family origins from Reasi and Srinagar. Not any Punjabis afaik. I dont think there's any Pandit or Jatt mixture afaik, but there may be Rajput on the Dogra side. I am uncomfortable revealing last names - though I think you know mine already Simranjit :-). a) I think some East Asian especially Southeast Asian ancestry. b) I wouldn't focus much on distance here. c) HRP0064 is eastern Punjab. Not sure if that's the reason or something else. d) People from Kashmir can be very different. Some in the foothills are basically like Punjabis. The Euclidean distance dendrogram had NW separating out at 0.2 (except HRP0044 at 0.3 and Zack at >1).